As one of the UK’s best-loved festivals, Latitude Festival in Suffolk has carved itself a very niche market with consistent lineups of some of the best indie/rock/alternative music available. 2015 marks the 10th Birthday of the esteemed event and to mark the occasion it’s tipped as one of the exciting lineups the festival’s seen so far. While I’m slightly surprised to see Alt-J at the tip of the bill, there is due cause for this- to celebrate the ten-year span of Latitude. Alt-J have been rising up the musical food chain just as the festival itself has- nodding at the pair’s long-lasting history in which they’ve performed on smaller stages in the past, but now headline the festival that’s helped them along the way. The second headliner is the highly elusive, commercial and critically acclaimed, trip hop juggernauts Portishead- one of my personal favourites. As well as this, the third and final headline act is Noel Gallagher’s High Flying Birds. Across the rest of the festival you can expect to see a plethora of indie gems such as the calming, soulful vocals of Toro Y Moi, or the genre-criss-crossing Years & Years. James Blake looks to beam his trademark post-dubstep sound across the Suffolk countryside with his spot on the main stage, while expect a hit-filled set from the massively underrated (in my opinion) Manic Street Preachers on the Sunday. As I said, Latitude is a festival that consistently sticks to its roots and maintains its aura and vibe for its loyal fan-base. It continues to maintain its very specific image with the unveiling of its 2015 lineup, not only is the bill filled with an array of fresh to respected musicians, its subtle nod to its history and 10th anniversary with the placing of Alt-J at the head of the announcement, you really have to take your hat off to Latitude Festival with the unveiling of its 2015 lineup. UPDATE: As most festivals do, Latitude continues to update its already exceptional lineup, not just with new artists. While acts such as The Boomtown Rats, Santigold and Roni Size Reprezent are all added to the musical lineup, comedians such as Russell Kane, Tom Deacon and Jason Byrne are all added to the star-studded assortment of comedians. 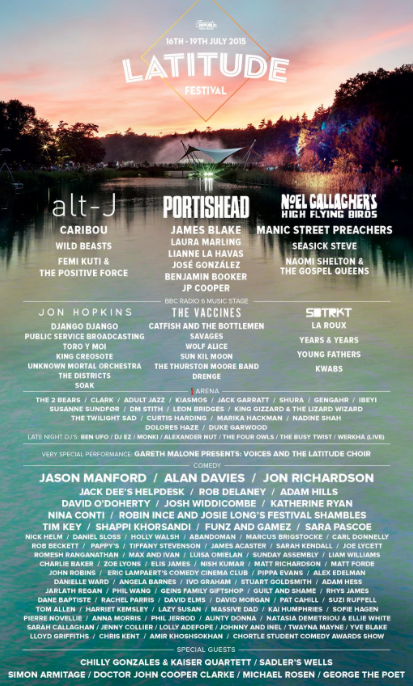 Finally, also added to Latitude’s roster is an arrangement of poetry and literary names including Frank Turner, Henry Marsh and Patrick Barkham. To peep the full list of all the additions to Latitude 2015, head over to their website.